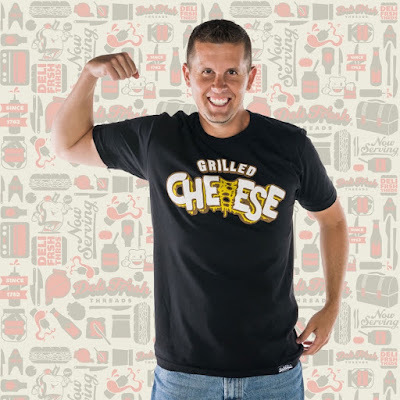 In honor of National Grilled Cheese Day earlier this month, Deli Fresh Threads has released this deliciously awesome Grilled Cheese Sandwich t-shirt! This is actually the second grilled cheese themed tee Deli Fresh Threads has had on its menu. The first shirt is now sold out, so DFT turned to Lain Lee III of Third Wonder for help in solving your grilled cheese cravings! Did you know the original grilled cheese sandwich was served open faced and started in 1920 during the great depression? In 1960, people started putting the top slice on and its been one of America's favorite sandwiches ever since! This new Grilled Cheese Sandwich t-shirt is available now, in sizes S-3XL, at the Deli Fresh Threads online store for $24.99.